IF TIME used to be gold, then today in the 21st century — still metaphorically speaking, though — time is already diamond. It is, indeed, a fact that the value of time can never be understated. Hence, things need to be done in a haste or at the least amount of time possible. Every second that ticks is, after all, equated to money. Today’s society undoubtedly values time, but of course, without putting quality and quantity on the line. Who does not want to get the most and best of everything? And if there is one piece of equipment at par with the demand of the society and can deliver all that, it has to be the copier machine. A copier can offer you speed, quality, and quantity; indeed, an all three-in-one machine. This has been known to generate multiple copies of a document for just a few minutes. But, what makes a copier different from a printer? Well, copiers were invented with a sole purpose of reproducing a huge number of document copies in just a few minutes, you won’t even break out in a sweat. If it takes a few minutes to make two copies of one document from a printer, a copier, on the other hand, could accomplish it in just a few seconds! 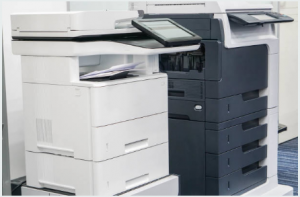 Imagine the amount of time you could save by relying on a copier for your printing needs. And the best part? The printing quality is never compromised despite its speed. You can have the machine print in huge bulk for a few minutes and still retain the same great quality. Just make sure it has ample supply of toner. If you need a copier, you have the option to purchase or lease one. You can rely on the machine’s durability, speed, and performance. So, if you require these features and characteristics in one machine, a copier would be your best bet!